Yvonne answers: The most important thing is not to do this too early or to shock your plants with conditions that they are not used to. Your plants are acclimatized to low indoor light conditions and warm temperatures. They also haven’t experienced strong outdoor sun and wind for a long time (if ever), and they will need a period time to get used to real-world garden conditions gradually. This is called “hardening-off” – the same process that indoor or greenhouse-grown seedlings need to undergo before you can plant them into garden beds. Before you move house plants outdoors, it’s a good idea to re-pot them up into a larger container. 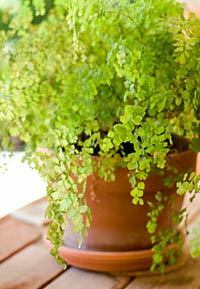 Just go up to next largest pot size – avoid putting a small plant into a pot that is way bigger than its root system. Use a soilless potting mix, and water well. Timing is important. Most house plants come from tropical or subtropical regions, and should stay inside until night time temperatures are above 50°F (10°C) and there is no more danger of frost. Check the average last-frost date in your area. Where I live (USDA Hardiness Zone 5), for example, that date is about May 15. When you take your house plants outside, put them in a shady spot for the first 10 days to two weeks, and keep them out of the wind. Be ready to put them back into the house or the garage if overnight temperatures are forecast to go lower than your plants’ tolerance, whether that is 50°F (10°C) or 32°F (0°C). Once your house plants are outside, check them every day or two to see if they need watering because potting soil dries out more quickly outdoors. Gradually give your plants more sunlight – a bit longer each day. If you notice white patches on the leaves, this could be a sign of sunscald, so move them back to a shadier spot. If this isn’t too severe, the leaves should recover.